One month ago, in a surprising reversal, we reported that Bridgewater was outperforming peers this year even after losing money in April, largely as a result of a a massive derisking, i.e. turning bearish. As Bloomberg further added, "the fund has also reduced its net long bets on U.S. equities to about 10 percent of assets from 120% earlier this year, and that overall, the fund is net short equities." In one of Bridgewater's latest Daily Observations authored by co-CIO Greg Jensen, the firm writes that "2019 is setting up to be a dangerous year, as the fiscal stimulus rolls off while the impact of the Fed's tightening will be peaking" a point echoed yesterday by the head of the Indian central bank, Urjit Patel, who warned that unless the Fed ends its balance sheet reduction which comes as a time when the Treasury is soaking up dollar liquidity by issuing substantial amounts of Treasuries to fund the Trump budget, the tightening in financial conditions could lead to a global conflagration started by emerging markets. Markets are already vulnerable, as the Fed is pulling back liquidity and raising rates, making cash scarcer and more attractive - reversing the easy liquidity and 0% cash rate that helped push money out of the risk curve over the course of the expansion. The danger to assets from the shift in liquidity and the building late-cycle dynamics is compounded by the fact that financial assets are pricing in a Goldilocks scenario of sustained strength, with little chance of either a slump or an overheating as the Fed continues its tightening cycle over the next year and a half. To justify his point, Jensen notes that markets are pricing in that the world is pricing in a "goldilocks" world at the start of 2020, with 2.4% growth, 3.0% 10Y yields and 2.8% Fed Funds rates, which is essentially "an extrapolation of current conditions, with expected growth and inflation near perfect levels. The yield curve is priced to be flat, oil to be at $62, and the dollar to be down 3.5% against developed world currencies." Looking at pricing dynamics, the world's largest hedge fund also notes that "expectations are for inflation to remain at fairly benign levels just above the Fed's 2% target, and options pricing reflects little investor demand for protection against the potential for the economy to bubble over. On the other hand, it also shows virtually no chance of deflation, which is a high likelihood in the next downturn." Needless to say, Bridgewater is skeptical: "we doubt this picture of calm priced into markets will actually play out." But what is most ominous, is Bridgewater's forecast beyond the end of 2019, when mysteriously most other permabullish projections are cut off. As Jansen writes, "while such strong conditions would call for further Fed tightening, there's almost no further tightening priced in beyond the end of 2019. Bond yields are not priced in to rise much, implying that the yield curve will continue to flatten. 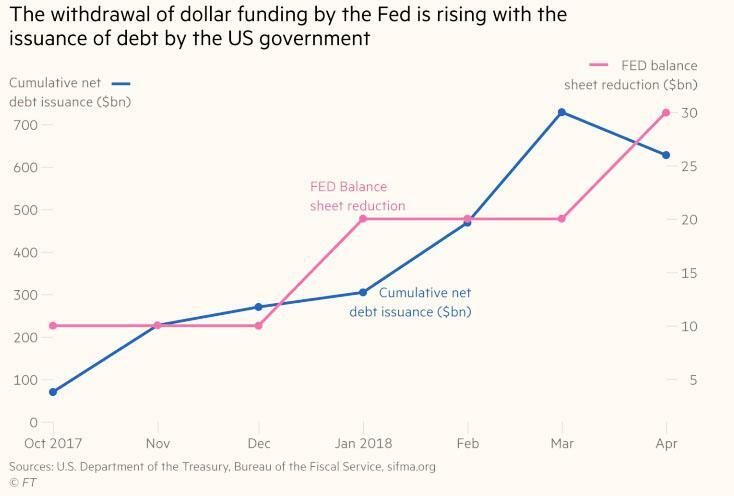 This seems to imply an unsustainable set of conditions, given that government deficits will continue growing even after the peak of fiscal stimulation and the Fed is scheduled to continue unwinding is balance sheet, it is difficult to imagine attracting sufficient bond buyers with the yield curve continuing to flatten." With all of the above in mind, Bridgewater has one simple message: sold to you. Don't worry though: Dennis Gartman remains bullish.